Libya’s capital under assault by a renegade army as Libya appears to be sliding back into a state of civil war. As things go in Donald Trump’s world, outgoing U.S. Homeland Security Secretary Kirstjen Nielsen got off lightly. Libya appears to be sliding back into a state of civil war, as a renegade warlord continues his assault on the capital city of Tripoli. At least 25 people have been killed and 80 wounded since the fighting began on Thursday. And today, the city’s sole functioning airport was closed after an airstrike. The United Nations says at least 2,800 people have been forced from their homes by the battle, but that many more remain trapped in harm’s way. The international body is preparing to pull its non-essential staff out of the country, following similar moves by a multinational oil firm, and the removal of an Indian peacekeeping contingent and U.S. anti-terrorism troops over the weekend. The eastern Libyan National Army (LNA), led by Khalifa Haftar, is said to be within 20 kilometres of the centre of Tripoli and bent on toppling the internationally recognized government of Prime Minister Fayez al-Serraj. The 75-year-old Haftar was one of the generals who helped bring Moammar Gadhafi to power in a 1969 military coup, but later fell out with the dictator and spent two decades in exile in the United States. He returned to Libya to aid the NATO-backed operations against Gadhafi in 2011, and has remained a major power-broker in the eastern half of the deeply divided country. There had been hopes that a planned UN conference later this month might finally result in a deal among Libya’s many competing factions to hold national elections and re-establish a semblance of law and order. 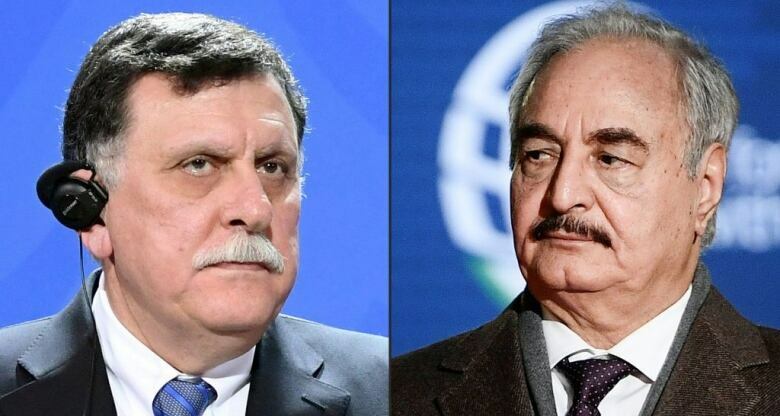 But in recent months Haftar’s forces have boycotted negotiations, moved to seize oil fields in the east and south, and then launched their multi-pronged attack on Tripoli. The international community is hardly of one mind when it comes to Libya’s future. France, the Saudis and Egypt are backing Haftar and the power brokers in the East, while Qatar and Turkey have been supporting al-Serraj’s government in Tripoli, a city with at least four active militias. The United States, G7, European Union and Russia have all called for an end to the current fighting, to little effect. And a UN callfor a temporary two-hour ceasefire to allow for the evacuation of wounded civilians was roundly ignored. The fighting caused oil prices to hit a five-month high today. But the chaos in the country is already largely baked into the markets. The march on Tripoli may disrupt the flow of 300,000 to 400,000 barrels a day, but Libya remains a long way from its mid-70s oil wealth high-point when it was pumping three million barrels a day. Eight years after Ghadhafi’s execution the nation hasn’t even managed to equal the 1.6 million bpd that was flowing as his regime crumbled, and as many as a third of its 6.5 million people are estimated to be living below the poverty line. She was dismissed via a terse presidential tweet on Sunday, before she could post her own resignation letter. But Nielsen was at least politely thanked for her 16 months of service, which included implementing and defending administration policies like separating migrant families at the U.S. border, and holding children in chain-link-fenced pens. There are already a number of leaked stories about how her reluctance to seal off the border to stop the flow of Central American asylum seekersangered Trump. But the president has yet to publicly trash her job performance — like he did with, say, his former attorney general Jeff Sessions. And Neilsen leaves in a more dignified fashion that Rex Tillerson, the former secretary of state who was fired while he was on the toilet. Nielsen is the 12th cabinet-level appointee to leave the Trump administration in just over two years. But the overall churn at the White House has been far greater. For example, Trump is now on his third chief of staff, fourth national security advisor and seventh communications head. Kevin McAleenan, who Trump has named as Nielsen’s acting replacement, becomes the fourth Homeland Security boss during his presidency. The Health and Veteran’s Affairs portfolios have both already had four head honchos. Even before Nielsen’s departure, the Trump administration had already set a record with 66 per cent turnover in its White House “A Team” over the first two years. That exceeds the 63 per cent churn that George W. Bush had over his first four years, and ties his father’s full-term rate of attrition. And Trump is closing in fast on Barack Obama’s (71 per cent) and Bill Clinton’s (78 per cent) first-term rates. Not that surprising for a former reality TV star who made “You’re fired!” his catch phrase. But it’s also a partial explanation for why the U.S. president has found it so difficult to fully staff his administration, with just 436 of 717 positions that need Senate confirmation filled as of today — and 140 jobs still having no nominee. A true act of friendship. – John Edwards, New Zealand’s privacy commissioner, in a since-deleted tweet-storm about the many perceived sins of the social media giant, under the hashtag #Don’tGiveAZuck. Two storeys, three bedrooms and all the mod-cons. This tour through one of the feature attractions at the 1958 Home Show in Toronto spends a lot of time on the Swedish modern touches, teak and foam cushions. But today’s viewer is more likely to be captivated by the price — just $15,690 or $140,687 in 2019 dollars.